Now available exclusively at HIGH-END PALACE the new 2019 TRIPOINT TROY ELITE NG 10th Anniversary Limited Edition. World-Class ultra high-end ground conditioner component made in a exclusive 160 pounds chassis. This masterpiece is made out of solid brass 24k gold plated and solid aircraft aluminum with massive 3" solid brass spikes. The Elite NG features exclusive technology and design with four massive custom made 10th Anniversary solid copper Master GROUND CORE modules with new oversize binding post to achieve the next new frontier in Audio realism. The new GROUND CORE modules achieve the highest level of EMI/RFI filtration to date. Every detail has been maximize to eliminate negative resonances and dispense all high frequency noise from the signal path. Experience Tripoint Audio best work to date. 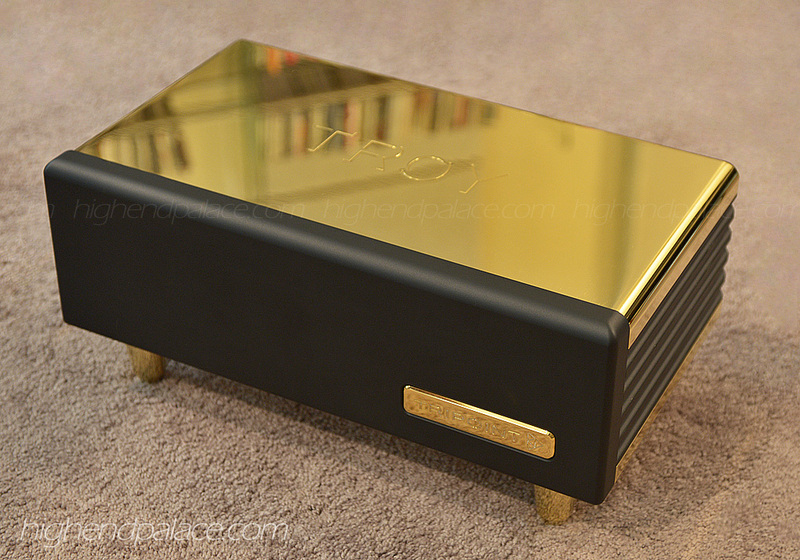 Only 36 Troy Elite NG will be made worldwide, with only twelve units per year since it takes a month to finish each of these audio reproduction masterpieces. Contact me for Tripoint Audio demo. I can also arrange a demo in your high-end audio system anywhere in the US, Canada, South America and Brazil. I will personally guarantee an absolute shocking improvement in performance in any high-end system. Absolutely everything improves when you ground your system to a Troy! Finesse, image focus, music depth of field, dynamics, separation in the stage, frequency extension, music expression, feeling of the music and deep removal of grunge in the electricity even of you think you have the perfect system with dedicated AC lines and dedicated ground just for your audio system. Link to website: TRIPOINT AUDIO. Contact me for during our Tripoint promotion! The link bellow takes you to 12 pages of Tripoint owners posting their opinions at a discussion forum at audio exotics. LINK TO DISCUSSION FORUM: audio exotics. If you hear the Troy Elite NG, it will change your thinking. The way you prioritize your components when building a high end system will be completely shattered. Troy Elite NG has showed me that speakers and ground box are the two most important factors if you want to achieve a out of normal experience from what you’ve heard at every industry trade show that you’ve attended in your lifetime. That includes your own system or any other system. 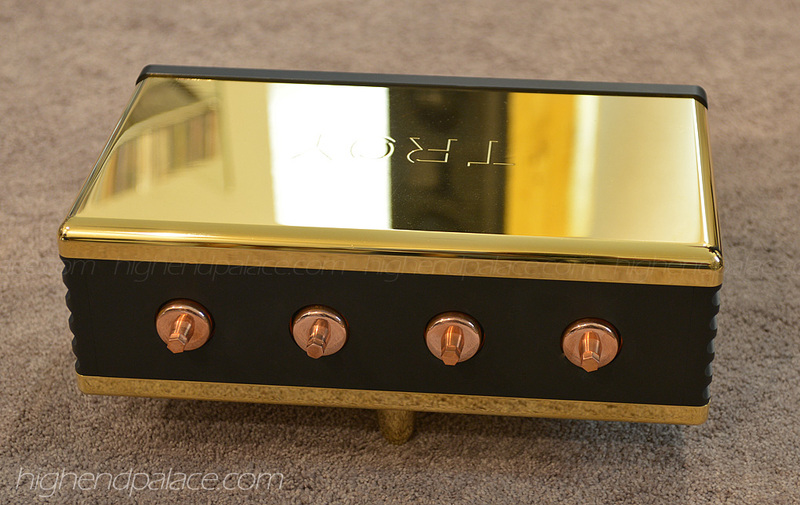 Troy Elite NG leaves the normal hifi experience and puts you with the performers on stage. Experience something that you thought was impossible to accomplish in audio reproduction. My attention turned immediately to the Zanden Jinpu phono which allows curve selection on top of the standard RIAA curve. Chris selected the EMI curve in reverse phase to play it. We went back to RIAA and the sound was obviously wrong. This LP under the Arista Label was produced in the 90s. Why does the EMI curve right the RIAA so much? Chris simply follows the menu from Yamada san of Zanden to choose the right curve with respect to different recording labels. We both went thru the journey of using Zanden Model 1200Mk3 that also supports curve selection. Yet, the differences before was not as profound as now. Without getting the fundamentals right, all assessments on gears are inconclusive. In Divin Lab, it is not anymore about achieving absolute zero distortion from the engineering measurement standpoint. It is about the transcription of aura into musicality. After all, the human ears is not a linear measurment system. God made our ears a non-linear system. The extreme realism achieved by Divin Lab is attributed to: (1) minimal phase distortion amongst the drivers of Gobel Divin Majestic speakers. (2) availability of eq curve selection for analog playback. (3) the presence of the almighty Tripoint Elite NG. What followed in the audition were all reference recordings that I knew extremely well except Mahler Symphony No 5. Every time when a track of music was played, my son's reaction was identical to mine - very different from what we listened at home. When Chris switched back to RIAA on the same track, the experiences resembled mine at home. When the right curve was selected, I can hear more pauses and pulses. The voice of God in Noye's Fludde (Decca curve, reverse phase) was so authoratative coming out from the rock solid Hartvig Statement turntable coupled with Miyajima’s flagship Destiny 天命 cartridge mounted on Thales Statement Gold arm. That stunning voice coming from a height of around 10 feet corresponds to the pictorial descriptions in the pamphlet. This is THE best ever playback on this musical I have ever experienced. It is picturesque. Next was Mahler symphony No 5 (teldec curve, positive phase) that I seldom listen. We discussed at length on the role of the conductor in the symphony. We could easily feel the pacing of each sub instrument group within an orchestra follows the baton of the conductor. This is amazing. Now I understand why there must be a conductor there. Because each group’s pacing are somewhat different. The conductor’s job is to synchronise them so as to achieve harmonious tonality in a holsitic way from the orchestration. It is hard to imagine what I experienced at Divin Lab. Next was my favourite Dvorak Symphony No. 9 ‘New World’ by Fricsay, DGG (teldec, reverse phase). This is a very enlightening orchestral piece to describe the challenges and homesickness of Dvorak living in America as his new home. Never could I imagine an audio replay system revealing all the mechanics of orchestration of BPO was so ambivalently emotional under the command of Fricsay. We no longer refer to transparency of audible details. Rather it is the ‘inaudible’ aura that transpires into emotions. Joan Baez, Diamond and Rust in the Bullring is the most favourite of mine. This live recording captured the chorus of the audience like surround sound alongside the reverberation of the huge Bullring stadium. With the correct eq curve setting on Zanden Jinpu, my son and I were repeatedly amazed by the palpability of Joan Baez alongside the audiences. Indeed, we felt like sitting together with audiences singing in chorus with Joan! The magic disappeared once the eq curve was back to RIAA.